The show Sunday night at the Crystal Ballroom was billed as “Goldrush” and featured four ‘Myspace buzz bands’ including: Low v. Diamond, Alice Smith, Mates of State and headliner Santogold. In an evening with four bands my expectations for the first band were pretty low, but Low v. Diamond delivered and impressed me with a strong set that felt more like a headlining set than an early opener. With good chemistry, a full textured rock sound and a talented lead singer Low v. Diamond showed showed real potential. Their sound is rocky ballad that can be filed comfortably between The Killers and Snow Patrol. Low v. Diamond was followed up by the very stripped down Alice Smith. Accompanied onstage with only a single electric guitarist Alice Smith showed quite solidly that she has the presence to fill the stage. Her set captivated the audience who seemed to hang on every note. Smith’s vocals often have the affectation and texturing that’s reminiscent of Amy Winehouse, but she’s really at best when she lets go of the vocal styling and is just herself. Alice Smith shines when she seems to loose herself in the emotion of her songs and I’d love to see here again when she’s backed by a full band. Alice Smith was followed by Mates of State, a keyboard and drum duet which moved swiftly through an upbeat and poppy set. I really wanted to like Mates of State, they are an extremely affable band with very listenable harmonies, but I felt like I had to really work to like them. Many of their songs are so packed that there’s very little room to really connect with them. Some of the songs take left turns which clearly left the audience behind. Mates of State did their job as an opening band, but the need some fine tuning to really grow. After Mates of State there was an extremely long break as the stage was stripped almost completely bare. The crowd was clearly impatient waiting so long for Santogold, but all frustrations were quickly erased as she took the stage. Although it was a relatively short set Santogold was on the top of her game for every moment of it. Without a single drop in energy Sontogold’s set was celebration from the first note to the last. Backed only by a DJ and two backup singers Santogold filled the stage with a contageous energy which flowed into the crowd. I saw more people dancing at the Santogold that almost any other show I’ve seen at the Crystal. The set which lasted just over an hour featured most of the songs off Santogold’s debut album. In many of the recent concerts I’ve attended you can tell which song gets the most radio play because it’s usually the point when the crowd comes alive. At the Santogold show the crowd responded to each song like it was a ‘hit’ song. 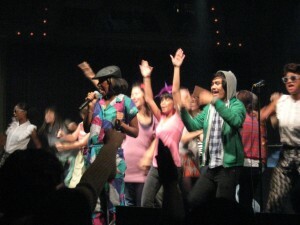 Santogold performed one cover, The Clash’s Guns of Brixton, transforming it into a rich and contemporary song. Even though the show’s music came from a turntable the show never felt pre-programmed or stiff. At one point Santogold messed up the lyrics to a song, laughing she ran out into the crowd pulling fans up on to stage for another go. The result felt like a dance party. Santogold is the real deal, she’s an immensely talented performer who is even better live than in her recordings. The concert at the Crystal Ballroom was her first performance in Portland, but it certainly won’t be her last. Santogold is clearly a star on the rise and she’s got the potencial to be an extremely hot ticket the next time she’s in town.